One of the most liberal markets in Africa and the first country on the continent where the number of mobile subscribers has overtaken fixed-line users, the Republic of Uganda is poised to become a unique laboratory for the development of wireless Internet. Already, the primary means of corporate access to the Internet is from microwave radio and GSM data services are growing. With two cellular operators already in the market, and with the newly-privatized incumbent, Uganda Telecom Ltd., planning to start a third mobile service, the likelihood is that mobile may become the primary form of Internet access within the next five years. A mission to Uganda was carried out in February 2000 involving Michael Minges and Tim Kelly plus a consultant, Walter Brown. The mission was co-ordinated with the Ministry of Works, Housing and Communications which is currently drafting an Information Technology (IT) policy document for consideration by Parliament. 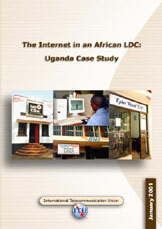 The Internet case study will help shape the recommendations to be presented. Preliminary suggestions regarding IT policy have been contributed to the Ministry.